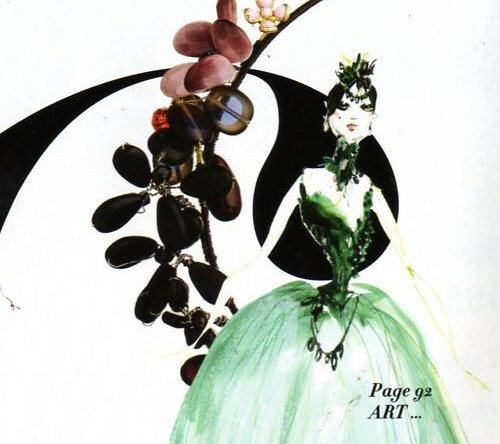 Flipping through this month’s magazines, I spotted a fashion illustration by Christian Lacroix which set me off on an internet trawl for more to feature here. I love spreading the word on fashion illustrators as you will see by doing a quick search on the blog. A year or two back, I bought a series of fairytale books illustrated by different fashion designers – Lacroix’s was The Sleeping Beauty. So pretty. If you want a reference book, perhaps a better place to see more Lacroix fashion illustrations is in Christian Lacroix On Fashion. Or, for a more instant hit, my internet search led me to a number of fabulous blogs featuring Christian Lacroixs’ illustrations so, if you’re interested, go Google and explore. A few of the illustrations I liked are below, all linked back to the blogs I found them on. Enjoy and let me know of other great fashion illustrators that you like. I’d love to learn of more and will be featuring others here again, I’m sure.